Previous to 2016, GHA entered into a Contact with the owners in which they agree to provide their labor during construction, to make material contributions to the construction of their house, and to maintain it over time. Depending upon their resources, a family will be asked to pay a percentage of the construction costs, provide an equivalence in building materials for the project, or donate their labor to other community projects. When a family is able, it will contribute 25% of the construction cost over a period of 5 years, interest free. Beginning in the summer of 2016 GHA began to create 'Labor Co-ops'. With this approach we are able to serve those most desperately impoverished families, those to whom our previous donation of approximately $8/month is still too much of a burden. Now groups of 3 families unite to provide a volunteer from each family to contribute their labor for a series of 3 houses. Their labor is then their only contribution towards their home. Our first eleven bajareque style homes built under this model were finished in March of 2017..a very successful change, which not only housed the most needy, but also inspired more community connections between the families. A fundamental concern of non-profits operating in Guatemala is to avoid feeding into a culture of Paternalism. 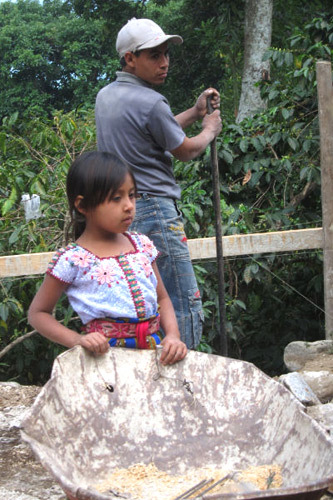 Guatemalans are famously hard working. Still there can be a tendency to wait for the next proyecto (any non-profit project) to visit the village. This predictable trap of passive entitlement is one we try to avoid by requiring considerable and continuous involvement by the family in the construction of their house and, with GHA's co-op model, the homes of their neighbors. Our mission always is to subsidize the family’s efforts to provide a decent home for themselves.